On June 7, 2006, I was fortunate enough to produce three of my favorite photographs of all times. Two are contest finalists, and all three are framed and on display in my home. Impressionistic photography attempts to convey the essence of the subject, rather than an accurate representation. 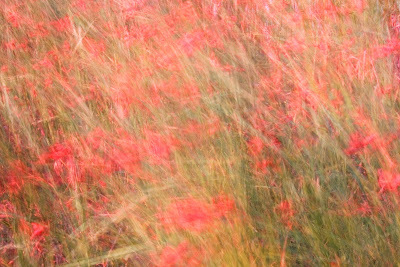 To be perfectly honest, photo impressionism is a somewhat risky endeavor, because not every viewer likes this sort of thing. And there is always the possibility that it can be seen as pretentious and self-indulgent. If I’m lucky, the impressionistic photograph will elicit in the viewer an emotional response. However, it is imperative that the photograph elicit a reaction in me. This image is a blended exposure of two photographs taken at about 7:11 PM. It was a windy evening, and the sea grass was being whipped back and forth. A shutter speed of 1/4 sec. resulted in a pleasing blur that captured the energy of the moment. The diagonal lines add excitement, and the grass adds texture. Whenever I view this photo, I feel the warm evening wind, I smell the sea grass and flowers, and I taste the salt in the air. This was a finalist in the Sheperd Spinal Center’s photo contest. Canon 20D f/20 1/4 sec. ISO 100 10-22mm lens @ 22mm.